Had a chance to make a quick trip to Costco and was delighted to find a couple of great organic and gluten-free deals! I was super-stoked to see this one: Suzie’s (the maker of one of my staples from Costco – rice cakes or corn cakes) now has gluten-free pasta! 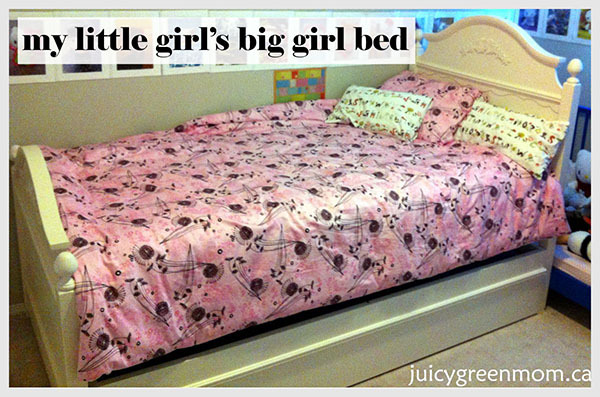 I’m thrilled to post about the finished big-girl non-toxic bed! My daughter is loving being a big girl. (Plus she doesn’t sleep half on/half off the bed anymore.) The bedframe itself is the Abbey Trundle Bed from Costco.ca (this model is no longer available, but they have alternatives), made by CafeKid.